Health information exchange (HIE) is technology that supports the flow of health information among physician practices, hospitals, labs, and others, regardless of the type of electronic medical record (EMR) systems they may use. HIE allows delivery of the right health information to the right place, at the right time - providing safer, more timely, and efficient patient-centered care. WISHIN, Wisconsin’s state-designated entity for HIE, is responsible for developing HIE capability throughout the state. WISHIN’s products and services allow health care providers to securely share a patient’s medical information with other health care providers who have seen the patient—even if those providers are not part of the same practice or health system. Over time, as Wisconsin’s health care providers join WISHIN to share data, the benefits to patients and providers will be substantial. 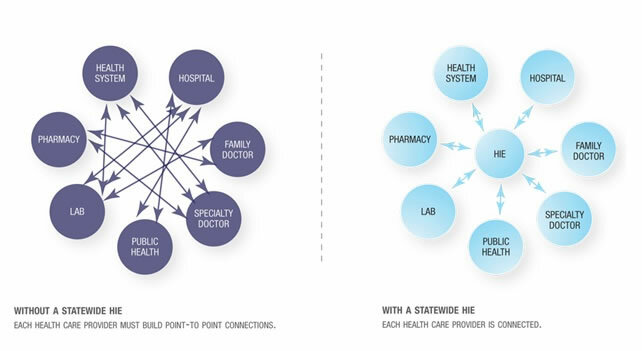 Combined with the widespread adoption of EMRs by hospitals and physicians, HIE is a critical component of a truly connected health care delivery system.